The rally outside Mitchell Earth Sciences (FEBE MARTINEZ/The Stanford Daily). Conflicting reports of physical altercations from both supporters and opponents of a talk by self-proclaimed Islamophobe Robert Spencer surfaced following the Tuesday event. The auditorium of nearly 250 was virtually full — with a line out the door — until approximately 150 students walked out of the event 20 minutes in, joining a larger group of protesters rallying outside the nearby Mitchell Earth Sciences library. Earlier in the night, a group of individuals who walked out of the event in protest reported being kicked and having their clothing grabbed at by other audience members as they left. Cairo Mo ’20 said they were kicked by an audience member on the way out. Alyssa Wright J.D. ’19 said that she and other audience members also witnessed the incident. After the event, members of the Stanford College Republicans (SCR), the organizers of the event, said they were followed by individuals dressed in masks, hoodies and red bandanas on their way out around 10 p.m. Philip Eykamp ’20, a member of SCR, told The Daily that when he was leaving the event with some of his friends, one man in a white hoodie approached and both verbally and physically harassed him — calling the SCR members “racists” and “Nazis.” Other witnesses present at the scene said they witnessed a verbal altercation but no physical contact. According to Eykamp, the group of SCR members called for security “when things came near to blows.” Another member of SCR who was present at the altercation confirmed the physical harassment but declined to be named. He said that the conflict escalated when the SCR members engaged with the attackers verbally, calling the masked people Nazis as well. Another student present at the time of the incident who wished to remain unnamed reported to The Daily that they saw no physical interaction between the parties. The Stanford University Department of Public Safety said that it could not provide information on the incidents until Wednesday. Spencer’s invitation to speak about “Jihad and the Dangers of Radical Islam” has sparked debate on campus among those who see the event as an opportunity to promote free speech and those who oppose Spencer’s rhetoric. SCR’s invitation drew criticism from undergraduate and graduate students, faculty and other Stanford community members who say that Spencer’s views constitute hate speech or are unimpressed by his body of work. Spencer’s audience included Stanford community members as well as individuals Spencer invited online via his website, Jihad Watch, and its Facebook page. By 7:40 p.m., the room for Spencer’s talk had reached capacity, and many attendees were turned away from the venue due to lack of space. Spencer began by expressing appreciation to attendees for showing up despite significant backlash on campus. Spencer also addressed accusations that his dialogue with students was aggressive and derogatory and constituted harassment. Spencer defended his speech by framing it as a discussion, rather than as harassment. “I have never called for violence or condoned violence,” said Spencer. Shortly after this comment, the majority of the auditorium got up and left, accompanied by loud Arabic music and Spencer’s speech into the microphone. Stanford Against Islamophobia clarified that the music was not associated with the original protest, which it said was intended to be a peaceful and silent reaction to the University’s decision to allow Spencer to speak on campus in the first place. Bora Erden ’17 M.S. ’18 participated in the walk-out during Spencer’s talk, which had been organized weeks in advance by the student group coalition Stanford Against Islamophobia. The individuals who planned to walk out filled the majority of the auditorium. One self-proclaimed “follower of Robert Spencer,” who gave his name as Sam Hyde and had no affiliation with Stanford, criticized the many students’ decision to exit. Hyde said that Spencer “merely read from [the Quran]” rather than inserting his own opinions, though Spencer’s text was a religious manual with some text from the Quran in it. “They blamed what was in the book on Robert,” said Hyde. Erden said that the purpose of the walkout was not to get a response from Spencer but rather to show that what Spencer had to say was not worthy of being heard. Spencer spent much of his talk condemning the Stanford student body and administration for the walkout, which he said constituted a failure of free speech — something he blamed University President Marc Tessier-Lavigne and Provost Persis Drell for. “If it costs, it will cost,” she said. About 300 Stanford community members protested Spencer’s talk in a rally and teach-in held at the Geology Corner. Students and researchers in the geology department prepared over four hours of teaching material about environmental issues in response to an email request from The School of Earth, Energy & Environmental Sciences that they avoid working in the building on Tuesday evening for security reasons. Most of the students involved in the teach-in were unhappy that they were told to leave the building, calling the instruction a disruption to their research for their dissertations or work on assignments. Fifth-year Ph.D. student Daniel Ibarra ’12 M.S. ’13 objected to the request in principle. “The fact that they were asking us to leave our place of work when this is an academic institution and we’re here to do research is conflicting with the mission of Stanford,” said Ibarra. Another student expressed disappointment with the University resources that went into the event. Outside the geology corner, students and other members of the Stanford community gathered to protest the event in a series of speeches, performances and chants. Stanford Advocates for Immigrants, Stanford Sanctuary Now, MEChA and the Muslim Student Union were among the groups that attended or spoke at the protest. The protest began promptly with ASSU senator and SJP member Hamzeh Daoud ’20 — whom Spencer’s blog has targeted for criticizing Spencer — leading a call and response. “When I say no, you say hate!” he called. “No! Hate!” yelled the crowd. 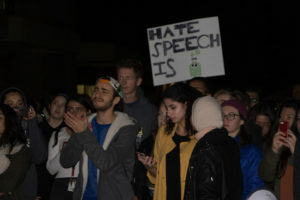 Some general themes of the evening’s speeches included standing up to hate speech and advocating the security of all religions and groups on campus. Not all participants at the rally intended to protest Spencer — some students were present only to spectate and were interested in hearing from those who supported Spencer as well. Ahn said she and her friends tried to get into the talk an hour after it began but did not manage to find seats. Others, however, turned out in solidarity with minorities and Muslims whom Spencer has targeted. Protest organizers Leenah Alfalih ’20 and Jana Kholy ’20 said they were happy with the way the rally went. “We are not giving this kind of speech a platform on this campus,” said Kholy. This article has been updated to reflect that Sam Hyde, a name given by one of the non-Stanford audience members, is the same as that used in a meme page and might not have been the individual’s real name. Contact Elias Mooring at eliasm ‘at’ stanford.edu, Ellie Bowen at ebowen ‘at’ stanford.edu, Michael Whittaker at mwhittak ‘at’ stanford.edu and Vibhav Mariwala at vibhavm at’ stanford.edu.